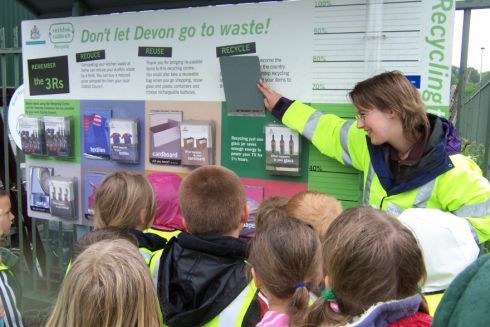 For 8 years DCC has steadily developed its waste education work, it is one of the UK’s largest waste education programmes, with over 20,000 children (aged 4 – 16) involved in assemblies, workshops, school waste audits and action planning, landfill site visits and Junior Life Skill events. Waste audits and action planning are an important part of the programme and are often the starting point for many schools in their campaign to minimise waste. The impact of the programme is clearly demonstrated with the average reduction in waste per school of 38.6% in 2011/12 academic year. The largest proportion of the work is delivered via a wide range of hands on workshops including on the 3Rs (Reduce, Reuse, Recycle), composting and litter in the environment. The workshops are developed by qualified teachers and have strong cross curricular links including science, maths, literacy, geography and PSHE (Personal Social Health Education). Programme feedback states 99% of teachers rating overall input as “good” or “excellent” and 96.2% of pupils “enjoying” or “really enjoying” the workshops. In a recent survey, 70% of teachers said that they have incorporated topics on waste into the curriculum or schemes of work as a result of the Waste Education Project. The programme has been running for 8 years. The most recent contract for delivery of the programme was awarded 1st Sept 2012. The new contract will run for 3 years with an option to extend annually for a further 2 years subject to funding.